Dora River Cleaning is an Other game on friv4school 2017. 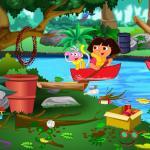 Dora River Cleaning: Dora is travelling on the river with her little boat and her best friend ( Boots ) and she is trying to clean the river. As they are travelling in a boat, they find that the river is polluted with litters, leaves and other contaminating things. 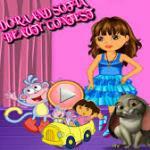 Dora and Boots need your help to clean up the river and the forest. Start this cleaning game and achieve the task in the given time. Good Luck!